Electric Roman Blinds Electric Roman Blinds, made to measure electric roman blind head rails. The Raex made to measure Electric Roman Blind head rail system offers that little touch of elegance and gives you effortless control over your Blind. The 24V DC option is ideal for those smaller blinds up to 2.2 m wide using a medium weight fabric. If your Roman Blind uses a heavier fabric or covers a much larger window width you can take advantage of our 230V AC system. 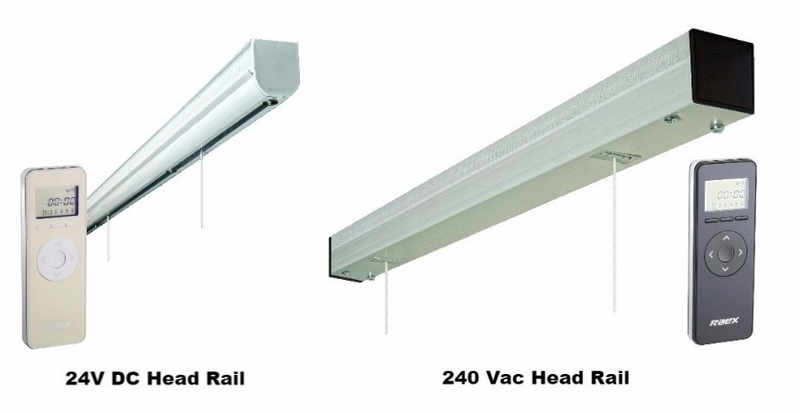 The 230V AC can lift much heavier blinds and cope with widths up to 4 m and very large drops. All our head systems can be controlled by the touch of a button or autonomously using the YRL2016 Timer remote control whether your at work or on Holiday. Alternatively, the Raex Roman Blind Head Rail systems can be built to integrate with Home Automation systems. All you need to do is specify the requirements at the time of order and our production department will do the rest. Roman Blinds are quite often a heavy window dressing due to the quality of fabrics used and the lining placed on the back to reduce light penetration. More and more people are considering Electric roman blind head rails for this type of application so as it makes it easier to use and avoid damaging or marking the fabric by using the chain operation at the side of the blind on a standard manual system. We offer either motorised head rails to suit all applications or the components so you can build into your existing system. The smaller 35mm head rail is a low voltage solution and is ideal for the smaller windows where space is limited. We also manufacture a 50mm head rail system which can cope with very large blinds and heavy weights. All systems can be configured to work with either a remote control, hard wired wall switch or Home automation systems. Motorising Roman blinds adds that touch of class to go with an already premium window covering. They make your blind completely child friendly and help to prolong the life and appearance of the blind.